Halloween at the Office: Halloween 2013: "Breaking Bad"
The RV was "sketched" out onto cardboard with colored duct tape fairly hastily (hence the octagonal wheels). I used a cheap aquarium pump that I got from Amazon under $10 (Tetra Whisper Air Pump) to make the bubbling bottles. I drilled holes in the caps, an ran aquarium hosing from one bottle to the next, sealing it with hot glue where necessary. The liquid is just water with a little food coloring in in. I printed out the "methylamine" labels in word, and glued them to empty recovery drink jars which I had saved up. The "smoke" was simply hot water and dry ice. A liter of hot water and a couple chunks of dry ice was enough to push the fog through the dryer ducting. You'll notice I got to re-use the bar top I made last year for my "Roaring 20's Speakeasy" theme. We bought some blue rock candy and put them into the little bags you get with clothes that have extra buttons/lapel stays in them. I found this scale for $2 (along with some of the glassware) at Goodwill! It was perfect! 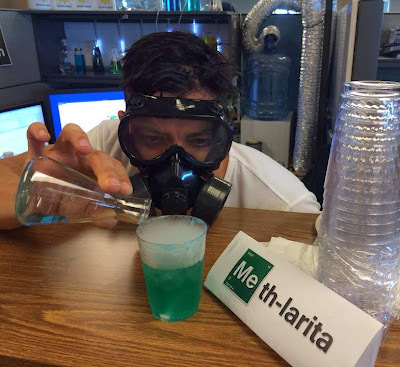 A cheap set of erlenmeyer flask from Amazon filled with salt mixed with a drop of food coloring finished off the props.